The newest guest to join Coffee with a Journalist this month is Lexy Savvides of CNET. On this episode, our host, Beck Bamberger, chats with Lexy about how she initially went to school for STEM, why tech brings her so much joy, and the good and bad interactions she has had with publicists over email. Lexy is currently a Senior Editor at CNET interactive in San Francisco. Her stories and videos feature the latest technology and technology projections for CNET. She is no newcomer to CBS Interactive, boasting over 10+ years within the company. She has become equipped with live social media coverage on the CNET Instagram feed and her coverage is featured often. She is also a technology commentator on televisions and radios across the nation. Pay close attention to this episode featuring Lexy Savvides from CNET and jot down some notes to learn more about her pitching preferences! Jered: Welcome to this week's episode of Coffee with a Journalist, a podcast that is just that. We have coffee, we've got journalists and we've got great conversation ahead. I'm Jared Martin, I'm the co-founder and COO here at OnePitch. Beck: And I'm Beck Bamberger, I'm also the co-founder of OnePitch, the CEO of Bam Communications and I'm your host today speaking with Lexy Savvides from CNET. She's an Australian and so that's fun already. And she also had, back when in her Australian days, a magazine called Cyclic Defrost, which we're going to talk about today. I think you guys will really enjoy. Beck: Everyone we have today, a fantastic reporter from CNET that I'm excited to be here with, it's called Coffee with a Journalist and today we're here with Lexy Savvides. Lexy: You got it, you got it. That's it. Beck: So we'll talk about that, just a little bit and let's just dive right in. I want to hear how you got to San Francisco from Australia, how you were working at this rocker publication that was called ... Wait a second, let's check Cyclic Defrost. So we're going to, we're going to talk about that. Beck: So first off, Australia. Tell me first about that being born and raised in Australia. Lexy: Yeah, so I started my career in Australia, in Sydney, born and raised there, went to university. Long story short, studied engineering and computer science, decided it wasn't for me. Beck: Okay. First let's mentioned that because we don't usually see that. So you have a Bachelors of Arts in Computer Science, but then you also have a Major in Information Systems/Modern history. Lexy: Yes. So I have a double degree. They do it a little bit differently in Australia. So you do a Bachelor of Engineering, Computer Science, whatever it might be. And then I also did a Bachelor of Arts because I was like, I don't want to start working yet. I want to do another degree and learn more because I'm just that sort of person. For better or for worse. So I did a degree in Computer Science, decided it wasn't for me, and then I went back and I explored the humanity side and decided, yeah, you know what? Actually I could really do this. I could really try my hand at writing for a career. One thing led to another and I did a lot of freelancing. I did a lot of radio and I ended up landing, I guess kind of my first full time job out of university was at CNET in Sydney and this was many moons ago. Lexy: I don't want to date myself too much. But obviously with LinkedIn you can stalk and all that so you can find it out. Beck: But first off though, so was that before you worked at the Cyclic Defrost? Beck: We need to talk about this. Lexy: When I was in Sydney, I was an incredible overachiever and I don't say that, like I'm not talking myself, I'm saying that was incredibly stupid because I had so many jobs going at once. So I was working full time, but I was also doing a radio show on a great community station in Sydney, which is fantastic. It's called FBi radio. Lexy: And when you mention it in America, people are like, whoa you work for the FBI? Beck: It's capital F, capital B, lower case I.
Lexy: Yes, Free Broadcast Incorporated. That's what it stands for. So I was working there as a producer of radio and presenting my own show and then I decided ... Well also I need to pick up another job if I want to start working more in the publishing industry. So I went on board to Cyclic Defrost, which was Australia's only independent music magazine dedicated to electronic music. See I have the spiel down in my head. Beck: Of course, you definitely are, yeah. Lexy: So then I took over and became Editor and Chief a couple of years into doing that and then I decided, I think three jobs is a little too much. They're all pretty intense. And then the opportunity to move to the US came up and I decided, why not? You have to live a little, you know, #Yolo and all that, which is incredibly terrible that I just said that, can we scratch that? Beck: Scratch that, scratch that, take that off. Yeah, it even sounds nasty. Lexy: It sounds terrible, doesn't it? It's horrible. I mean that could be a little outtake at the end. Then like, oh dear lord. How did I say that? Beck: That's totally fine. But before you go, okay, wait, we got it back up for the degrees, so you're in this super stem stuff. You're learning modern history. I don't even know what that entails. Is that like 1920s beyond or like? Lexy: So we ... The way that it's structured is that you have a lot of free choice in what you get to do. So I decided to study a lot of modern history around the UK, America in particular, and modern Greek history, which was fascinating because I also speak Greek. So it was just sort of a little education for me in terms of my heritage, which was really nice. Lexy: And then I promptly didn't use it again really after college or after university. I think that's just generally what happens. Beck: But did have a moment somewhere, was there an "Aha" moment or just something, or did you fall into it where you're like, "Oh, I like writing and I'm just gonna keep going into a career into that?" Or was there something pivotal that happened? Or were you just kind of like, "yeah, I'm going to do this". Lexy: I was always a big writer as a kid and I used to enjoy writing, but then I also had the incredible pull from the other side, which was I love playing with computers. I love tearing them apart. I love putting them back together again. I taught myself html and and some Java script when I was kind of like a teenager making terrible websites on GeoCities and Tripod and shout out to anyone that remembers Crosswinds because that was my personal favorite. Lexy: But I think if anyone gets that reference, then big props to you. Beck: I'm going oh, we gotta Google that real quick. Beck: What does that mean, exchange to Greece? We don't have that here. Lexy: Well you do an exchange, it's almost like a gap year but not really. So it was like a gap two months or something like that, and it was all an amazing experience that the University of Athens organized as a part of a cultural exchange really. And so I went there and then I came back and I went, I think I want to start writing. It was just like, I had this really clear vision after going away and being away from my studies I guess, in the traditional classroom environment. I was doing classes in Greece, but it just felt different. It kind of felt like an extended holiday. Plus it was learning Greek, like studying Greek history and language too. Beck: A Red hot go? Lexy: A Red hot go, I'm going to drop it in here because I'm going to try and throw as many “Australianisms” as I can. Beck: Let's do it. Everyone wants Australian accent and phrases. By the way, what ... Okay. I'm not even gonna say it cause there's just some of the best cuss words come from Australia, or phrases. You know this to be true. Lexy: Oh I know. Isn't that sad that that's our cultural legacy, is amazing cuss words. Beck: The world loves that. Lexy: I guess I guess they do. Beck: And koalas, and kangaroos. Beck: All those things with pouches and cuteness happening. Okay. Okay. So then you get the job at CNET, but it's in Australia and you're running on accounts. You're also doing ... Now, you're also incorporating photography into that role. Beck: Which you also love, and you still do? Lexy: Yes, I do. I do. Lexy: Everything has collided. Everything's in one. It's all getting into a nice little melting pot and, and then the opportunity to come to the US comes up. I'd been doing a lot of video stuff in my role in Sydney for CNET, and I had a background in radio, so my now managers in the US saw what I was doing, and I guess they liked it enough to say, why don't you come over? Because there there's a job available here. And it was one of my ambitions at some stage in my life to live overseas, I just didn't know where. Lexy: And San Francisco, honestly was not on my radar at all. I had no idea that I would end up here. But it was kind of a nice treat because I thought, oh maybe London, because everyone in Australia goes to London at some stage. Beck: Oh really? Is that a thing? Lexy: Well not everybody, but a lot of Australians end up in London, New York as well. Yeah. San Francisco, not as much, but there's still, I think a growing community now because of the tech industry and a lot of talent is coming over here as well, especially with startups and the ease of getting a visa. So it is a really attractive proposition for a lot of people. And so I thought, okay, well why not? If I can have this opportunity, I might never get this again, so why wouldn't I take it? Beck: And was the offer position to you just, "Oh hey, we have this opening" ... It came to you or did you spot it and you're like, "Oh"? Lexy: So I'd been working really closely with my now manager and we'd been collaborating a lot on videos, getting a lot of feedback going back and forth. My role was kind of evolving to be video first rather than editorial, text based writing first and it just ... The stars ended up colliding. I would just say, can I come to the US is there any opportunity? And they would say no, not yet. And then all of a sudden out of the blue it just happened. So it was the right time, I would say in my life. Beck: So now you're hear in the SF, you're doing video production stories, quite a lot of interactive, I would say media and such, and it's not just writing articles, but it's producing the videos and such using probably all your skills from the radio days and the photography days and that you still do actually right now. Beck: What's been your impression of San Francisco as a foreigner and then maybe as American, but I would say San Francisco is its own place. Beck: So let's start there. Beck: Yes, it is a bubble. Lexy: It's a real bubble and I don't think it is representative of the rest of the US however, that being said, I love it. I get asked this question a lot. I kind of joke amongst my friends that whenever someone meets me for the first time in America, usually the conversation goes "Hi, what's your name? Where- Oh, you have an accent. Where is that from? Oh, how long have you been here? Oh, do you like it?" Lexy: It's not fun. However, that being said, I would not trade it for the world. Beck: Okay. Specifically more in the work that you do. What keeps you excited about that? Beck: I imagine it's like working with celebrities, let's say. You just get jaded by whatever A-lister's walking by you putting on a dress or something. You're just sort of like, oh yeah, that's just my day to day. Lexy: It's just my job. Yeah. And some days it is just like that. Some days it is just okay it's just a TV, but at the same time there are a couple of things that just make you step back and go, this is incredible. This is really the future that we were promised. Almost. Not quite, but almost. And it's good and bad. It's scary and it's thrilling and everyday is different, which is what I really enjoy. And it's a challenge everyday too because as well, like obviously with reporting, you know there are so many people covering the same story, so how do you cover that differently? How do you do it in a way that makes other people excited and not just going well, okay, I've seen this story five different times on different publications, how can I make this one stand out? And I guess I'm really lucky in my role, is that I get to do fun videos for a lot of my content. Beck: It says officially Senior Editor/Host. Lexy: Okay, well then we can say that. Lexy: Yes. So I host a lot of videos on CNET, which is super exciting and it's something that I love doing and it's something that I really think is an exciting way to tell stories, especially because it uses a totally different part of your brain. As a reporter, you really have to think about how you would say things in a way that is more conversational yet gets across the same amount of information in say a one minute 30 package as you would get across in a 5-600 word article. And that is a real challenge. And that has been, I think the biggest thing for me when I'm out on the field reporting, like if I'm doing a live cross or live package, how can I consolidate this information and make it understandable and make it something that is going to convey as much information as it would if I wrote the piece from scratch, sitting down at my computer. So that is a huge challenge and something that I really love about the job too. Beck: So break down the process of that a little bit and I come, I was in TV and did shows and you're like, oh and the B roll and the angle and this and the ... You know, there's so many parts of any piece of content you produce like a show like I was doing shows. And it's a frickin’ lot versus I think, oh, 500, 600 words, you know there's a sentence and there it is and start at that scene. I don't want to say it's easier, it's just you can just do it in two hours. You're done. There's a lot more, I think on the video side and the visuals and how you do it and how you piece it. So tell us how you go through that process, Like okay, you're going to do a story on x now what? Lexy: Well, it really depends on how I'm going to package it. So that's usually the first thing that I have to think about in my role. I do a number of different things. So primarily I'm making videos for CNET, which is on cnet.com all of our online distribution partners, our YouTube channel and so on. And then another component of my job is occasionally I do packages that go out to the CBS news network through CBS News Path. And that's always really exciting thrill, I get to sign up my story saying in San Francisco, Lexy Savvides, CNET..com for CBS news. I'm like, that doesn't, that just never gets old because I'm just thinking, wow, my stories are going out there to a big network, which is crazy. Sometimes people see me on TV when they're on vacation in like ... I had this situation where I was following, my boyfriend was down in San Diego and he saw me on TV, one of my packages and he was like, wow, she's following me around in different places. Lexy: I'm watching everything. So it really depends. I'm watching. It really depends on I guess which audience I'm writing a package for or a piece for. So if I'm writing something for CNET, I guess the first thing I start off with is what category is this under? Am I talking about a deep dive into a product? Am I doing an explainer? Am I doing a straight news piece? So that will then inform how I go about the rest of the process. I'm really lucky to work with a fantastic team and we all are incredibly supportive. I have an amazing set of producers that I have learned so much from. We have an amazing camera team as well in terms of our videographers and our editors, so it is a pretty painless process. Really what I like to think about first is what is kind of going to be my opening shot, you know? Lexy: You know exactly what I'm talking about coming from your background, you think like what does that one thing that I kind of want to get across first and how am I going to capture the attention in that first 10 seconds? Not even that because that's the crunch time for the viewer. Especially if a package goes out on TV they're kind of intrigued and then if you don't capture that within the first 10, 15 seconds, that's it. Same especially online with online video. People's attention spans are so short, which is totally fine, I'm exactly the same. I completely understand. So I think unless you go in knowing I want to sort of have a really deep dive into this particular topic area and I'm really going to dedicate a certain amount of time to it. You're not going to give something that much attention if it doesn't grab you within the first 10 seconds. Lexy: So it's, hard thing to do. Sometimes some of the content that I work on is pretty scripted and it's pretty much voiceover based and that's more of a straightforward news piece or a comparison or something like that. Other times it is very free form and ... Maybe free form isn't the right word. I do a lot of off the cuff stuff. I have a show called Beta test where I road test the craziest tech experiences, so you don't have to, that's the tag line. So that's a real, something that I do that is not very scripted at all. I go and experience something and you come along with me for the journey. So I obviously do a lot of research and a lot of pre-production to decide exactly what I want to talk about, but then when I'm in the experience, you're going along with me. Lexy: I don't script that out. That is just something that I just want to talk through. Lexy: Yeah. It's organic. It's like I'm chatting to you at a bar and I'm telling you about this cool thing that I did. That's how I like to approach that in particular, which is a lot of fun. So I guess that kind of informs how I'm either going to research and prepare for it or how I'm going to script it depending on the context. And at the same time I'm already thinking about visuals. I'm already thinking, well, what shot is going to best illustrate this point? Or what angle do you think like we're going to have to take in order to get, you know, people in a two shot. Is this going to be a one shot? Like how are we going to work with any existing B roll that we might have access to or is this going to be something that we're going to have to film entirely ourselves? Beck: I was gonna just ask that. Lexy: Yeah, most of the time we shoot pretty much everything ourselves and it's a lot of work but it makes the end product so much more rich. Beck: So that's a little particular question I have is if a PR person tee's up you with some nice looking B roll, are you like, oh thank God, yes, this is great. I'm more interested in doing the piece? Or are you eh, it doesn't really matter. If it's good, I'll use it? Lexy: Yeah, that's a great question. I get asked that quite a lot and I think a lot of the time it really depends on where I'm going to put this pace. If it's something that is a fairly straightforward news reporting piece and we can't get access to seeing this as easily as we could with say, another product, then maybe we would use that footage. Or at least, I would use it to inform what shots that we wanted to take and get an idea of what the product or the experience feels like. So the better quality the better of course. Lexy: We love that when someone has taken some real care and time into producing B roll, even if we don't end up using it in terms of our own video, it really helps us illustrate and get a picture of it in our minds of what we would like to do with it. So it really helps us regardless of whether we end up running with it in the video or not. But a lot of the times it is, it is really handy, especially for something that we don't have access to. Say for example, I use this example a lot. We can't go to the international space station, or not easily. Lexy: So if someone sends us some footage from the international space station that makes our lives a little easier until that becomes accessible to us. Lexy: I know. Can you send me to the International Space Station please? I have a cool show. I can do it on the ISS. Beck: How about that? Plan a trip. So speaking of just publicists and people providing you with things, let's talk a little bit about, I imagine your inbox and where publicists come to find you. How is that? Is it crazy in that inbox and how are the pitches? Lexy: It is, yes. I mean it is crazy. I think that's just part and parcel of the job. Everyone's inbox is crazy. The pitches that I receive is, it's a very mixed bag. I would say that I'm on a lot of mailing lists that are probably fairly irrelevant to what I report on and what I do cover and so that is an unfortunate incident. I'll look at the headline, I will look at like the first couple of lines and go, that's clearly nothing that I would ever cover or someone from CNET would cover. We're very consumer focused and that's the products that we do and experiences are all about that kind of experience rather than enterprise for example. Lexy: Yeah, those words don't make sense at all to our audience. It's not anything that people come to us to find stories on or to watch videos on. So like if someone's pitching me like an AI driven enterprise experience for warehousing, I'm just putting some words together but that would just be completely irrelevant for us. And so those pitches don't usually get a response unless it's somebody that I have a relationship with and has previously been aware of what we do, and then I will say thanks, but it's not really our area. Lexy: A lot of the times it's just a pretty cold reach out, which I completely understand. I have many friends on the PR side, so I know it's very tough work and sometimes that can get results. A lot of the times it doesn't. And maybe more times than not, more often than not. But that being said, those successful pitches that come my way is really from people that have taken a little bit of time just to sort of look at exactly what videos I've produced previously, the areas in which I cover and they've kind of crafted an angle that is really smart. Something that hasn't been given to me before, a level of access that we haven't had before. And they know when I'm looking for a story it's got to have good visuals, otherwise I can't cover it. Like I just can't. Lexy: Ding, ding, ding. And it's like, yes, let's do this story, it sounds interesting and it has all of the components that I want. When it doesn't have that, it's not fun. Beck: So how often does that happen? 2% of the time? 20% of the time? Lexy: It's fairly rare. It is fairly rare. Usually what happens is someone who will have developed a relationship with me, they'll kind of know what I like and go, well, there's a potential here for a story. What do you think? And I'll go, okay, well this is how I would want to package it and this is the level of access that I would want. And this is the point of difference that we would want for our audience. And then sometimes it ends up being a success and sometimes it doesn't. But at least then I've kind of made a good, some good inroads and then they have a little bit of a better understanding about what we do and particularly what I like to cover too. So that's, that's pretty much how it works. Beck: I was gonna say, you are quite, just engaging and I feel like there's some people who say, "Rah, oh, I wanna see this." So, you sound pretty nice. Lexy: Oh I hope so. Beck: There are some people who "Ah, I never want to see this" or whatever. So yeah. That's nice. Lexy: Yes. They'll come back and they'll say ... Won't be the same client though. Not with the same client. Not with same pitch. Beck: So they can be taught. Lexy: Yeah, they can. Oh, I mean, yeah. I mean everybody has room to to grow and we do too on the reporting side. Absolutely. I never want to sort of think of myself as being in a silo and not ever learning from the other side as well. It just doesn't work like that way for me. Beck: Or missing a good story. Lexy: Exactly. That's the worst part. If you have, you miss a story, and you see someone else gets it and something that you were kind of pitched but you didn't quite see it. That really hurts, that hurts, when you don't quite see the angle for you, like for your audience and then someone else grabs it and they do a really good job of it and you're like, Kudos to you. Why didn't I think of that? Beck: Yeah. Burn. Because it is competitive. You got to have that story that works. Beck: Well, let's back up just a bit and reflect. You've had 10 plus years now in the journalists ecosystem about ... Actually, and just over 10 at CBS at this point, getting onto the eleventh year. Oh my god. Lexy: It doesn't count, because it's been two different countries and two completely different jobs. Beck: It doesn't count, so. We'll just say a decade plus in journalism. If you had to go back to your college age self or teenager self or whatnot, would you go into this industry again? Beck: That doesn't sound too appetizing. Lexy: Yeah. But I mean when it comes to like ... I can pull apart tech and explain it in a way that everyone can understand. Well, hopefully, I mean that's hopefully the point of the job is making it so everyone can understand it. That to me is pretty fulfilling when I get that right. I'm pretty, I feel pretty satisfied with my decision. Beck: Oh, that's great. Okay, so here's the last question for us today, which I like to ask everybody, which is, and you can interpret this anyway. What do you think the future of journalism looks like? Lexy: Yeah, that's, that's a really hard one to answer because it's very broad and there are so many different interpretations. I guess I'll just answer it from my perspective is that there is always going to be room for great stories and regardless of the medium, regardless of of where it is being told, you can always make something that is really compelling and there's a lot of doom and gloom in the industry at the moment. But there are still people writing and producing amazing stories every single day. I'm on Twitter, looking at what people are creating, linking to on YouTube, even creators that aren't technically classified as journalists, making fantastic content. Lexy: And I don't think we should be too scared about that because I think people are always going to be driven to create great stuff. It's just going to be, it might live in a different place and it might live in a different format to what we are expected. So everyone's pushing into different platforms. You know, YouTube is huge. Social media is even bigger in many respects. So it's just about finding those stories. I think is going to be the hardest part because there's so much content to consume. It's so overwhelming and having a place that is going to consolidate all that. I feel like if anything, it's just going to get more spread out and more, difficult to find things than it is now. Given that so many platforms and so many companies are moving into over the top streaming services, there are so many video streaming platforms available and so many different ways in which you can consume, whether that's on your phone, whether that's when you get home and you're turning on your TV or even through podcasting, it's just an overwhelming amount. Lexy: So I think for me the future of media is going to be incredibly overwhelming cause there's going to be so much stuff and it's going to be finding the best content. So I would just want some way to consolidate it all and to find this stuff that I'm really interested in. And AI is getting there to help address that problem, but I still think it needs an extra human touch. Lexy: Well the robots are really friendly. They're actually here to help us. No, Honestly. They really are. Beck: But it's built by ... I'm all about the, we can't get away from how we are humans. We want to feel touch. We want ... No one is going to get the feeling from a hug, from a robot, for example, or the same understanding of a story if it's told by a robot on a stage versus a human. So I'm all just pro-human, and with that. Hey, how stories are told. That's what it's about. Beck: Go humans. Thank you Lexy. This has been fun. Lexy: Thank you for having me. Jered: Thanks for listening this week to coffee with the journalist featuring Lexy Savvides from CNET. 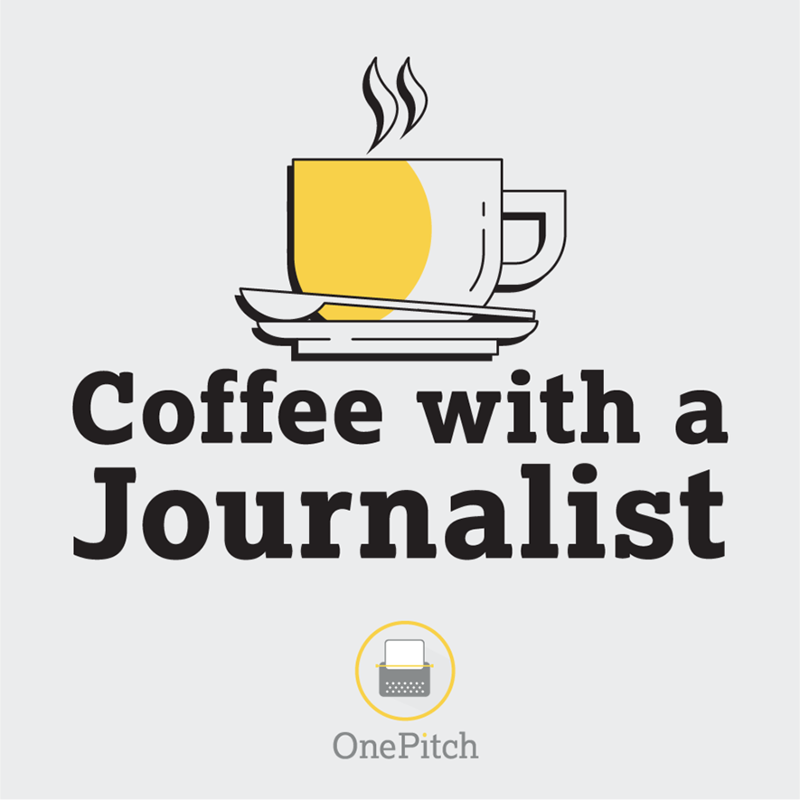 If you're a journalist who loves coffee or a publicist who loves this podcast, we'd love to hear from you. Head to OnePitch does CEO to drop us a line. Until then, let's end bad pitches and start great stories.